I passed all of my finals =D Need I say more? My summer will not pack many fun things, but that is okay because I need save up for school. Speaking of fun, I just experienced something amazing. As I was driving down Central I saw what appeared to be a bunch of giant butterflies circulating the inside of the roof of a little bridge. I had my windows opened and I had to quickly put them up because I didn’t want them inside my car (the roof is fairly low). Anyhow, I was mesmerized, I knew they weren’t butterflies due to the size and they were definitely not pigeons. As I got closer I realized that they were bats! 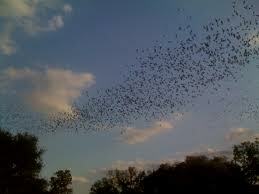 I am not a bat fan, but it was a beautiful sight. They were literally flying as in a current. There were hundreds of them and they formed a long long river (the best way I can describe it as) in the sky! I was so excited I slowed down and stared at them. I of course started to get way to excited and I had to keep my eyes on the road…..
Too bad my phone is a brick and I couldn’t really take of a picture of it. They all were flying towards the full moon and the sky was a beautiful blue & purple. Its something that you would see in movies (like Batman). I was half expecting to see a vampire or something crazy. I’m seriously in love with the sight! I took it as a sign….my summer is going to be freaking awesome!!!!!!!!!!! Closest picture of what I just saw- just imagine that the bats are flying towards the full moon and the sky is a beautiful dark blue and purple.